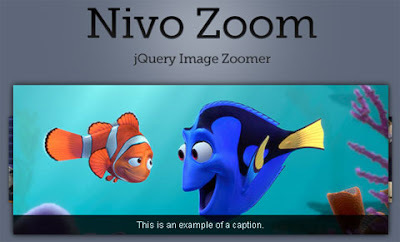 Nivo Zoom is a Lightbox-like but simpler image zooming jQuery plugin from the developers of the popular Nivo Slider. The plugin is lightweight (4kb compressed), focused only on images and comes with a bunch of settings.It supports 5 different zoom types and can show image captions (long texts are handled well).Nivo Zoom, by default, doesn't use overlays but can display the bigger image with an overlay where the opacity and colors of it can be customized. 2. Now Go to Design > Edit HTML. 3.Now search for the </head> tag and paste the following code just Above/Before it. 2.Go to the Post/Page you want to add Nivo Zoom and then go to Edit HTML tab . As you see we only added a class="nivoZoom"
Note: Please Host all the files on free hosting service like DropBox or Blogspot itself !